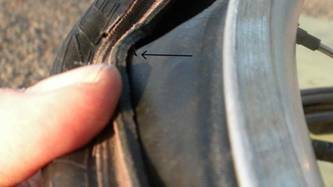 2.1 ...and How Often Do You Check Your Tires? Tires? Tires? Who cares about tires! They should just do "their thing" and not bother me! So, having gotten back from a 40 mile ride, I examined my tires. I do this after every couple of rides to make sure the tires are not too worn. They are Specialized Armadillo Elites so I seldom have flat tires on the road, but they do wear and I often find pieces of metal wire, from "road alligators" (i.e. truck tire delaminations) stuck into the tire really trying to give me a flat. 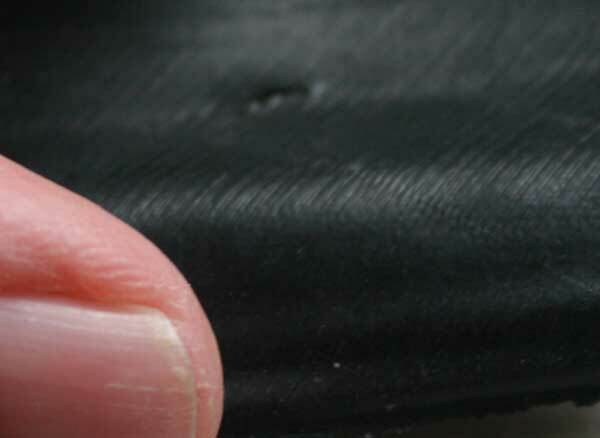 Yes, 1/4" pieces stuck into the tread is not what I like to see! I've learned to periodically look for these little devils hidden away in the surface of the tire. They are only a "dot" in appearance, but, once pulled out, they often turn out to be a bit bigger. While the Elites do seem to give me excellent protection, about once every 2000 miles, or so, I actually do get flats! If you look closely in the picture, I've enhanced a very nice 1/2" piece of wire that made it far enough in to give me a flat. 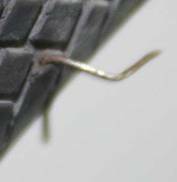 On the other hand, it was interesting to check the tires, on a different day, and find a piece of wire that simply grabbed part of the tread! And then, there is always the thrill of having your tire cut with a piece of glass hided in some innocent gravel! So, when was the last time you checked your tires?